South Koreans love StarCraft, but they totally aren't digging StarCraft II. In case you don't know this, StarCraft is incredibly popular in South Korea. So popular, in fact, that many people claim the RTS title is the country's national sport. As a result, you'd think that the recently-released StarCraft II would be just as popular as its predecessor. Surprisingly, it turns out the exact opposite is true. It turns out that the country's population is avoiding StarCraft II, though it's still playing StarCraft like crazy. According to recent statistics, only two or three percent of South Koreans are playing StarCraft II. This figure has got to be immensely discouraging to Blizzard, which spent $30 million on an ad campaign specifically targeted at South Korean players. 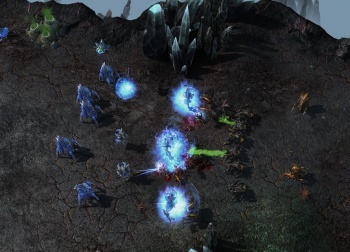 According to Geek.com, the reason for StarCraft II's failure in the country is because of Blizzard's mandatory Battle.net: "Starcraft is a multi-million dollar industry and e-sport in South Korea, sure, but Blizzard never saw a dime of that, so they introduced mandatory online Battle.net into Starcraft II, as well as a proviso making sure that any events and tournaments are authorized by Blizzard themselves." Hopefully Blizzard will take this as a lesson and move forward with some better ideas about how to not alienate an entire country. Still, knowing that you wasted $30 million has got to smart.